Sunday saw Graham & I take his Late Russian army to the fifth and final 2010 round of the Northern League. At 900 points it’s a big Field of Glory army and I was keen to see how it performed. However when I arrived I found we were to face a far worse enemy: the cold! It was cold outside (-4 centigrade or so) and just as cold in the hall. It didn’t warm up at all and I spent the whole day in my coat: I only ditched my woolly hat at lunchtime. My thanks go to Colin for the excellent, and free, “tatter hash” he provided for lunch and James Hamilton for buying me pint at half time. Without them I would have frozen solid. 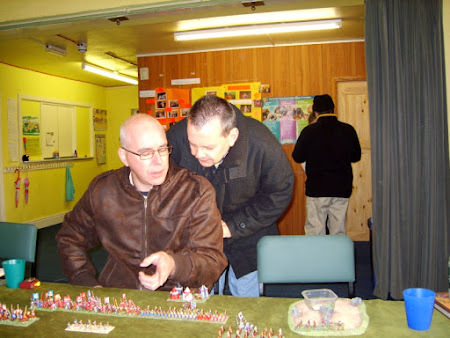 For the second round in succession we faced Steve Telford and Eric Jonsson (above) this time with their Late Hungarian army. However, it wasn’t very Hungarian as it contained a large Polish ally consisting of superior heavily armoured knights. We hoped to stop the knights long enough to work on a flank. They didn’t; we lost. 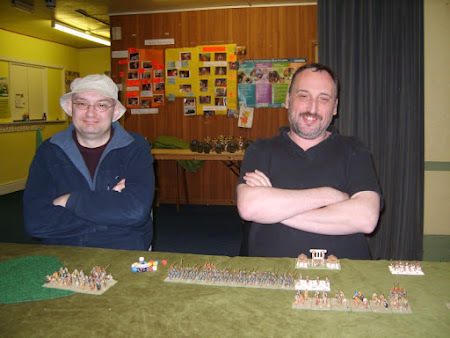 Neil Duffel & Mick Hood (above) had also been ridden down in their first game. However, with their massed cataphracts we faced the same problem as we did in the first game; with the same result. We caused a few problems on both flanks but nothing too serious for Neil & Mick. Despite the cold Mick played the game in only a t-shirt. From his description of his Saturday night activities I reckon he could only do this because he still had a lot of anti-freeze circulating in his system. Interestingly, both opponents anchored a flank on a piece of rough terrain (which are just visible in the photos). As a result they only used 75% of the available table width, whereas we used 95% or more, and they concentrated their shock troops in large battle lines. In these circumstances we have to find a way to loosen the anchored flank, so creating more problems for our opponents, otherwise we will continue to be ridden down against armies like these. All in all not a great day on the table but the competition and our opponents were great fun.